You had gastric banding surgery to help with weight loss. This article tells you how to take care of yourself after the procedure. You had laparoscopic gastric banding surgery to help with weight loss. Your surgeon placed a band around the upper part of your stomach to separate it from the lower part. The upper part of your stomach is now a small pouch with a narrow opening that goes into the larger, lower part of your stomach. The surgery was done using a camera placed in your belly. The camera is called a laparoscope. This type of surgery is called laparoscopy. These problems should go away as your body gets used to your weight loss and your weight becomes stable. Weight loss may be slower after this. Take short walks and going up and down stairs. Try getting up and moving around if you are having some pain in your belly. It may help the pain. If it hurts when you do something, stop doing that activity. If you have laparoscopic surgery, you should be able to do most of your regular activities in 2 to 4 weeks. 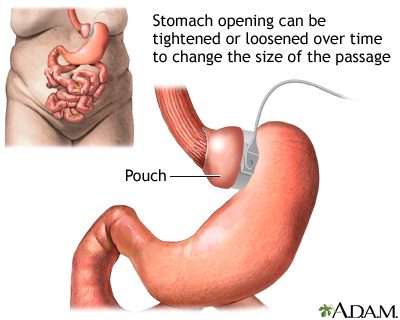 Laparoscopic gastric banding made your stomach smaller by closing off part of your stomach with an adjustable band. After surgery you will eat less food, and you will not be able to eat quickly. Your health care provider will teach you about foods you can eat and foods you should avoid. It is very important to follow these diet guidelines. You will eat only liquid or puréed food for 2 to 3 weeks after your surgery. You will slowly add in soft foods, and then regular foods. Keep your dressings (bandage) on your wounds clean and dry. If you have sutures (stitches) or staples, they will be removed about 7 to 10 days after surgery. Some stitches can dissolve on their own. Your provider will tell if you have this kind. Change the dressings (bandages) every day if you were told to do so. Be sure to change them more often if they get dirty or wet. You may have bruising around your wound. This is normal. It will go away on its own. The skin around your incisions may be a little red. This is normal, too. DO NOT wear tight clothing that rubs against your incisions while they heal. Unless you are told otherwise, DO NOT shower until after your follow-up appointment with your provider. When you can shower, let water run over your incision, but DO NOT scrub it or let the water beat down on it. DO NOT soak in a bathtub, swimming pool, or hot tub until your doctor tells you it is OK.
By the time you leave the hospital, you will likely have a follow-up appointment scheduled with your surgeon within a few weeks. You will see your surgeon several more times in the first year after your surgery. A nutritionist or dietitian, who will teach you how to eat correctly with your smaller stomach. You will also learn about what foods and drinks you should have after surgery. A psychologist, who can help you follow your eating and exercise guidelines and deal with the feelings or concerns you may have after surgery. The band around your stomach is filled with saline (saltwater). It is connected to a container (access port) that is placed under your skin in your upper belly. Your surgeon can make the band tighter or looser by increasing or decreasing the amount of saline in the band. To do this, your surgeon will insert a needle through your skin into the access port. Your temperature is above 101°F (38.3°C). Your incisions are bleeding, red, warm to the touch, or have a thick, yellow, green, or milky drainage. You have pain that your pain medicine is not helping. Your skin or the white part of your eyes turns yellow. Your stools are loose, or you have diarrhea. You are vomiting after eating. Gloy VL, Briel M, Bhatt DL, et al. Bariatric surgery versus non-surgical treatment for obesity: a systematic review and meta-analysis of randomised controlled trials. BMJ. 2013;347:f5934. PMID: 24149519 www.ncbi.nlm.nih.gov/pubmed/24149519. Mechanick JI, Youdim A, Jones DB, et al. Clinical practice guidelines for the perioperative nutritional, metabolic, and nonsurgical support of the bariatric surgery patient--2013 update: cosponsored by American Association of Clinical Endocrinologists, The Obesity Society, and American Society for Metabolic & Bariatric Surgery. Endocr Pract. 2013;19(2):337-372. PMID: 23529351 www.ncbi.nlm.nih.gov/pubmed/23529351. Richards WO. Morbid obesity. In: Townsend CM Jr, Beauchamp RD, Evers BM, Mattox KL, eds. Sabiston Textbook of Surgery. 20th ed. Philadelphia, PA: Elsevier; 2017:chap 47. Thompson CC, Morton JM. Surgical and endoscopic treatment of obesity. In: Feldman M, Friedman LS, Brandt LJ, eds. Sleisenger and Fordtran's Gastrointestinal and Liver Disease: Pathophysiology/Diagnosis/Management. 10th ed. Philadelphia, PA: Elsevier Saunders; 2016:chap 8. Restrictive gastic operations, such as an adjustable gastric banding procedure, serve only to restrict and decrease food intake and do not interfere with the normal digestive process. In this procedure, a hollow band made of special material is placed around the stomach near its upper end, creating the small pouch and a narrow passage into the larger remaining portion of the stomach. This small passage delays the emptying of food from the pouch and causes a feeling of fullness. The band can be tightened or loosened over time to change the size of the passage. Initially, the pouch holds about 1 ounce of food and later expands to 2 to 3 ounces. Reviewed By: Ann Rogers, MD, Associate Professor of Surgery; Director, Penn State Surgical Weight Loss Program, Penn State Milton S. Hershey Medical Center, Hershey, PA. Also reviewed by David Zieve, MD, MHA, Medical Director, Brenda Conaway, Editorial Director, and the A.D.A.M. Editorial team.